Hong Kong Chief Executive Carrie Lam, (6-R), the Governor of Guangdong Province Ma Xingrui, (6-L) and other Chinese government representatives officiate at the opening ceremony of the Hong Kong section of the Guangzhou-Shenzhen-Hong Kong Express Rail Link at Hong Kong West Kowloon Station in Hong Kong, China, 22 September 2018. 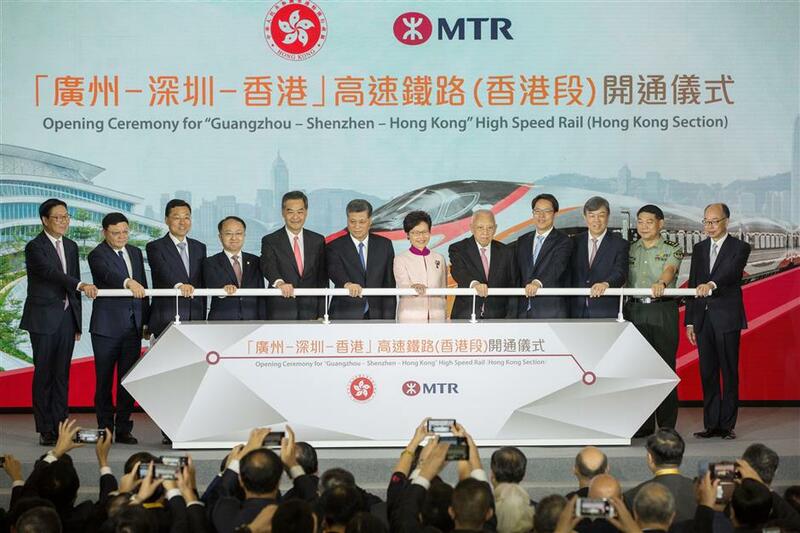 The opening ceremony of the Hong Kong Section of the Guangzhou-Shenzhen-Hong Kong Express Rail Link was held Saturday at Hong Kong West Kowloon Station, one day ahead of the official operation of the first high-speed train from Hong Kong to the mainland. The opening of the XRL marks Hong Kong’s official connection with the national high-speed railway network, Lam Cheng Yuet-ngor, chief executive of the Hong Kong Special Administrative Region, said at the opening ceremony. On the B1 Level of the station, Vice Chairman of the National Committee of the Chinese People’s Political Consultative Conference Tung Chee-hwa, Vice Chairman of the National Committee of the Chinese People’s Political Consultative Conference Leung Chun-ying, Governor of Guangdong province Ma Xingrui, Director of Hong Kong and Macao Affairs Office of the State Council Zhang Xiaoming, Director of the Liaison Office of the Central People’s Government in the Hong Kong SAR Wang Zhimin and other officials officiated the opening ceremony. “Pearl of the Orient” and other songs played by Hong Kong violinist Yao Jue and Hong Kong String Orchestra as well as the video narrating the development of the railway in Guangdong and Hong Kong commenced the opening ceremony. Lam Cheng Yuet-ngor, Ma Xingrui, General Manager of China Railway Corporation Lu Dongfu and Chairman of the MTR Corporation Ma Si-hang delivered speeches at the ceremony. Lam Cheng Yuet-ngor and Ma Xingrui also unveiled a display embodying the official operation of the West Kowloon Station, the terminal of the cross-boarder high-speed rail trains between Hong Kong and the mainland.